What results from a life of trusting in man vs. trusting in the Lord? The purpose of LikeTreesPlanted.com is to offer a resource center of practical and specific “how-to’s” for walking with Jesus – for following Him – for living and loving like Him. Personally, my first responsibility is to disciple my children, and so I have the three of them at the forefront of my mind as I edit together the posts for this blog. My foundational Scripture for disciple-making is Jeremiah 17:5-8. This Scripture demonstrates my desired outcome for my kids as they grow in their followership of Jesus – and for ANYone who lives in an active relationship of trust in – and obedience of – God! This is what the Lord says: “Cursed is the one who trusts in man, who depends on flesh for his strength and whose heart turns away from the Lord. He will be like a bush in the wastelands; he will not see prosperity when it comes. He will dwell in the parched places of the desert, in a salt land where no one lives. I am a very visual person, so I like to think in pictures. I like to “see” an image of the Scripture in my imagination as I study, with the Lord’s help. This is where the elementary part comes in – just stay with me. This Scripture describes two people: one who is “cursed” and another who is “blessed”. 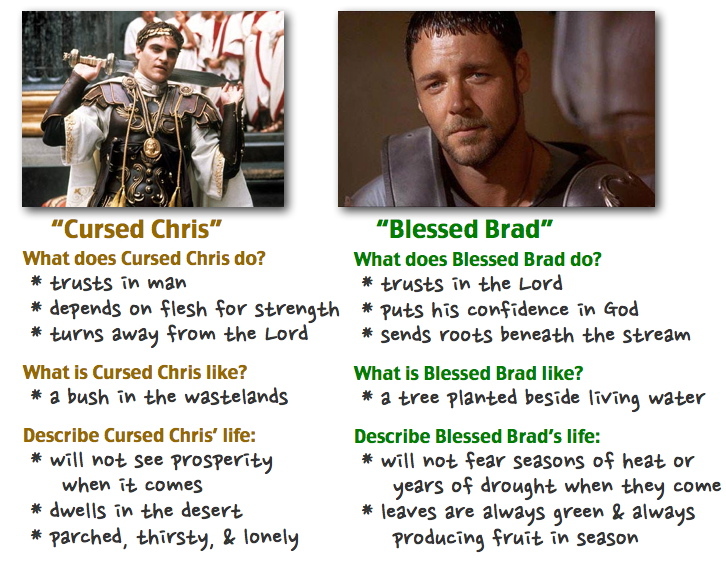 And since I also like alliteration, I’ll call them “Cursed Chris” and “Blessed Brad”. These images show us what results from a life of “trusting in man” versus “trusting in the Lord”. A bush in a parched wasteland is basically a tumbleweed: no root structure, no nourishment, no real confidence, no fruit borne… A tree planted by streams of living water, though, is rooted, nourished, sturdy, and productive! Here’s the point of this post – and indeed, the point of LikeTreesPlanted.com as a whole: I want to be like “Blessed Brad”! I want my children to be like “trees planted by living streams of water”! And I want each of you to be trees just like that – I want us ALL to be like a forest of God in our towns! A forest of trees who “trust in the Lord”, who “do not fear when heat comes”, whose “leaves are always green”, who don’t “worry in the years of drought”, and who “never fail to bear fruit in season”. That’s what I want to be, that’s what I want my children to be, and that’s what I want all who would read this blog to be. ← What you feed grows; what you starve dies.